Please note on the platform signs a lug is missing off of the platform 3 and platform 4 signs . The other 6 supports are perfect . The Knapford station is the fourth one, built in the town in 1984. It has two platforms, a glass roof, and about eight trains a day. 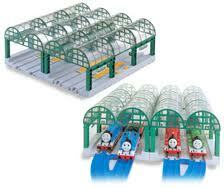 A fun accessory to complement the Thomas Motor Road and Rail system from Tomy. A great looking train station that holds four trains. Switches either stop the trains in the station or allow them to move straight through. Roof sections can be removed to allow easy access to each train. Six pieces of points rail are also included to add to existing layouts.